My general bias when contemplating screws at the hardware store is that the only versions of the fastners that are “high quality” are decking screws, which indeed I use a lot for making jigs and serving as clamps for laminating and such. Trying to find old-format slotted flat head wood screws there is a fools errand. Not only is everything a Phillips head, but the quality of the screw material itself is so sub-par that I (and probably you) have countless tales of screws wringing off as soon as you bear down on them. 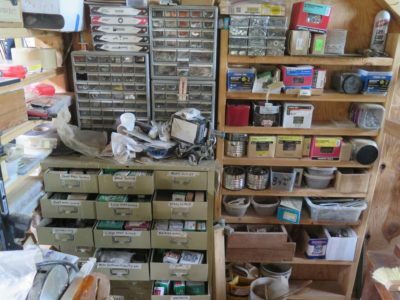 It’s not really the fault of the hardware store owners, my store back in Maryland has owners who have become good friends over the years and I talk to them often about their products, but they have very limited options in their product pipeline. For screws those options are usually a choice between mediocre products and products they would not even deign to have on their shelves. 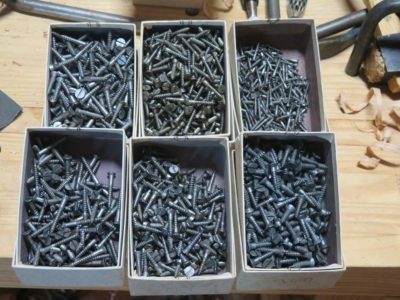 As a result I had begun lurking for lots of old fashioned screws, stopping at garage sales and on-line auctions with modest success. This container is filled with the sorted contents of one such purchase on-line. It is all useful but not a systematic selection. Often I find boxes of NOS screws on ebay but the prices can be stratospheric. Given my own psychopathology and domicile remoteness (I want to have a full range of fasteners at my disposal at all times) I have the habit of buying a full box whenever I needed a half dozen of somethings, guaranteeing they would be ready for me next time. They don’t go bad, and the nook underneath the stairs to the third floor resembles a mini-hardware store. The racks in between the joists around the corner hold several hundred linear feet of metal bar stock and the like. Some time ago I was discussing my frustration with with cheap hardware store screw with Jim Moon and he pointed me in a most excellent direction — Blacksmith Bolt and Rivet. They might be already well-known in the wood world or to you but it was news to me. I have since made several purchases from them and have been pleased with their products and service. 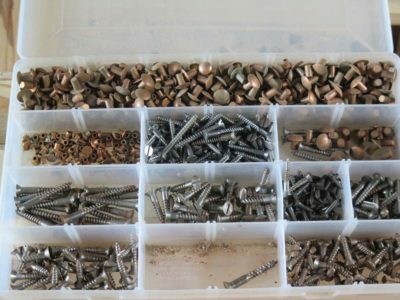 My inventory of screws from them is growing slowly, once again whenever I need some I order three or four times as many and put the extras in a labeled box to go into the correct drawer in my mini-hardware store. Since I do not solicit nor accept advertisers for this site I am delighted to give you a heads up with this unsolicited endorsement.